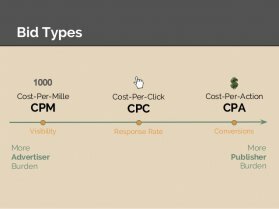 There are three main ways of pricing online media – CPC, CPM, and CPA. The difference between the three is what deliverable the Publisher and Marketer agree to bill on. As you’ll see below, the pricing structure often reflects who has the bargaining power, as well as the quality of the product. CPM, which stands for Cost-Per-Mille (Mille is Latin for “thousand”), is when the price is based on 1, 000 impressions. Almost all Publishers prefer to bill on impressions because it is an inventory based product, rather than a performance based product. In other words, publishers risk nothing on ad performance with a CPM system and get paid for every impression. For the largest and best-known Publishers, this is the pricing standard and in terms of overall cost, CPM priced media is almost always at the top of the food chain. For smaller publishers without much of a brand however, selling their inventory on a CPC basis is often the only option they have. But don’t let the disdain among premium Publishers fool you, the CPC media business is an immense, multi-billion dollar market and there are plenty of people making a fortune off clicks. Just ask Google – Google’s AdSense product is the largest CPC clearing house on earth that attracts Publishers and Marketers by the thousands. CPC is a very low risk way to buy media because Marketers only have to pay for performance, so they have some level of confidence in their return on investment. CPA, or Cost Per Action, or sometimes Cost Per Acquisition is the best deal of all for Advertisers in terms of risk because they only pay for media when it results in a sale, or conversion against their campaign goal. At this level, Marketers can pick the most they’re willing to spend for a sale and can basically set an unlimited budget and forget about it. Similarly to CPC pricing, this is usually an awful deal for Publishers. Affiliate Marketing programs operate on a CPA basis with Publishers that are exclusively devoted to hawking their products with sites that are more advertorial than anything else. To help visualize these pricing options, look at the table below, which shows how $1, 000 of media would need to be priced and perform for each method discussed above. ماذ تعني CPM PTP CPA CPC ? Effective Cost Per Mille or eCPM (as it is often initialized to) is a phrase often used in online advertising and online marketing circles. It means the cost of every 1,000 ad impressions shown.